A "threatening" note to Sen. Dean Heller, R-Nev., was left at the lawmaker's Las Vegas Senate office over the weekend, police said Monday. Officers discovered the note after responding to a burglary alarm that had been set off on Sunday morning at the main entrance of an office building where Heller's Las Vegas office is located. Police determined that no break-in occurred at the office, a spokesperson for the Las Vegas Metropolitan Police Department told NBC News Monday. "However, a threatening note addressed to Senator Heller was discovered near the door to his office," the department said. An investigation is ongoing, the department said, and police will not be releasing the note's contents "at this time." Heller's office had said earlier that police were investigating a weekend break-in at the lawmaker's Las Vegas Senate office. 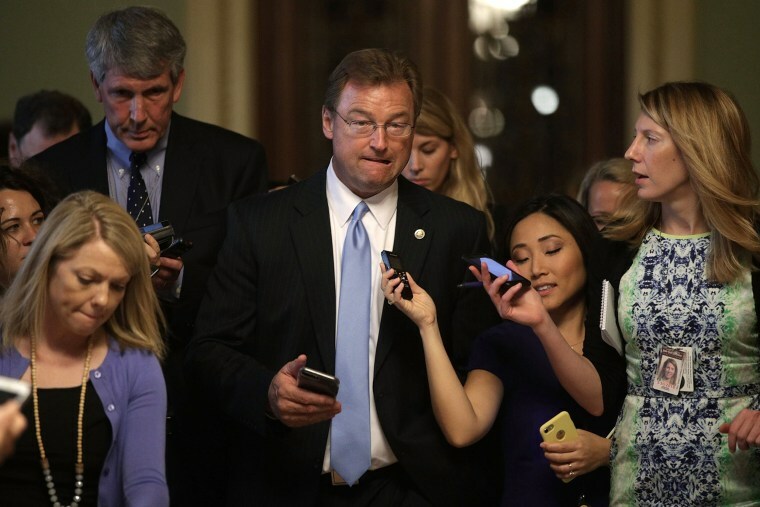 Heller has attracted attention within his party in recent weeks for expressing his concerns over the GOP’s Senate health care proposal. Heller is also the only GOP senator up for re-election in 2018 in a state that Trump lost, making him one of the most vulnerable Republicans in the next election. He has pointed the Senate bill’s dramatic reductions in Medicaid as the primary reason behind his concerns regarding the proposal. More than 600,000 people in Nevada are on Medicaid, including disabled and low-income children.